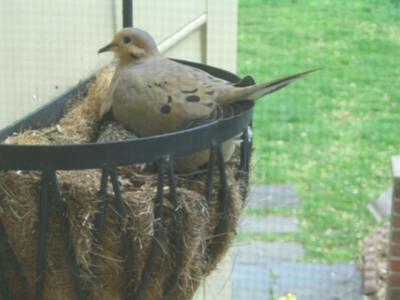 Last year during nesting season we noticed a pair of doves frequenting our front porch planter. When they repeatedly landed there and started bringing in materials it became obvious that they were making a nest. We kind of had an idea what was happening but then when two eggs appeared it was confirmed. This year they were back again and after reading up on the subject we discovered that this is normal and that they often return to their original nesting area. We have to walk up stairs and pass within a foot or so of the nest. They've become very comfortable with our frequent passing and we'll often stop and say hello (slowly and quietly). 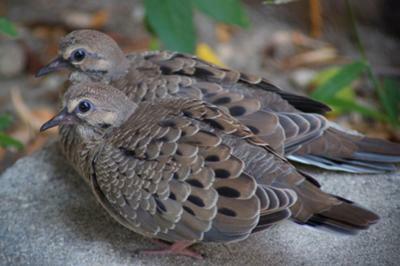 Two young ones just flew from the nest a few days ago and are now huddled together on the ground in the back yard. The parents are usually somewhere very near and watching over them. We keep a close eye out for neighborhood cats as we lost two last year to the felines. I have included photos of the latest pair. Enjoy! Hello. I have a question, if anyone can help. 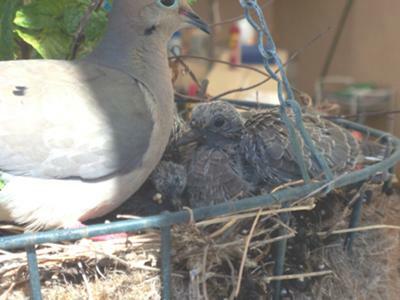 I have had continuous mourning doves making a nest in one of my planters. 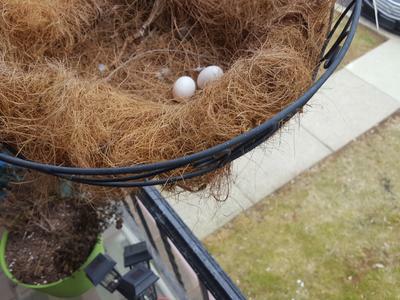 About 2 weeks ago I came out to my front porch to find that something had knocked down the planter with 2 eggs in it. I found one egg and it was cracked open and then I found the other egg with a couple of pieces of the outer shell gone. I put that one back in the nest. The mom returned to the nest and was frantically looking all over the nest and bobbed her head up looking outside of it too. I was so sad. She left and I haven’t had any doves since. Does anyone know if the doves will come back. My parents have the same situation at their home. To prevent interrupting their nesting, we enter the home thru the side garage door. I have two planters hanging on my second story condo railing. 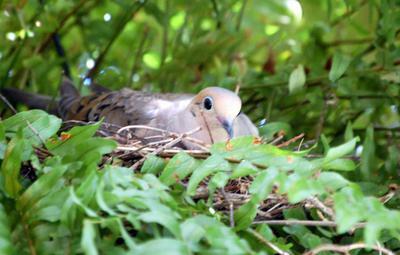 I was getting ready to plant new annuals when I noticed that a mourning dove decided to use one for her nest. The little flower pot that I had left in there from last year is now her nest. I only saw one egg but yet two chicks appeared one day. I think they hatched a week or so ago....and I know they were there at 4 am this morning. I checked because we were having another storm yet again. I have been worrying about the parent and chicks during this bout of bad weather. When I came home from work tonight around 9 pm, I went to see how mom and chicks were doing and they were not there. I am so worried that the the chicks fell out and into the bushes down below, but I am hoping that perhaps they flew off.?.?.?.? I am wondering at what age do the chicks fly off? Is it possible they flew off or did they fall out? I would try to look in the bushes below but it has been cold today and this evening and I doubt they survived the cold...also I do not remember them having too many feathers yet. If they fell out of the nest, will mom or dad stay with them in the bushes?? Can anyone advise on this? This is my first experience with mourning doves in the wild. I am used to domestic parrots, not wild birds. Just wondering if I should try to find them in the bushes below or not? Thanks. The photo I posted is a stock photo of five day old chicks, and I am using it because my chicks looked like these chicks only slightly bigger. I hope they had a chance to be able to fly away, but I don't see how they could. Hope someone can help. Something like that happened to me just about a month ago. 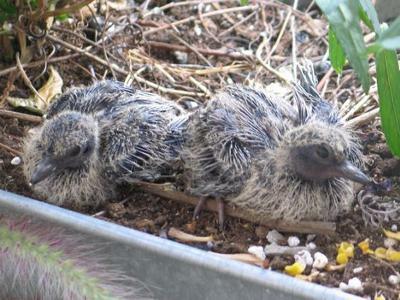 This last brood was the 4th for the mourning dove couple in my hanging basket. I now wonder if the early broods in a year behave differently than the summer broods. In Feb I noticed that I had one lonely egg in the basket, the mother was constantly in the nest so I could not find an opportunity to peek in to see if there were other eggs... Finally I had the opportunity and found 2 chicks of different sizes plus that lonely egg between them. About a week later all chicks were gone but that lonely egg. I poked open the egg which was no longer viable anyway! Since the doves have returned and expect that soon I will have still another brood to enjoy!! Suggestion.... put that basket under cover since the eggs are soft and water will destroy them. My basket is hanging from the ceiling of my porch. Best wishes for your dove family, they will find you again. I won't be doing that often. The winds were already at 20 & the storm was bringing in 30-40 with gusts up to 60. Stormy today, but more normal. 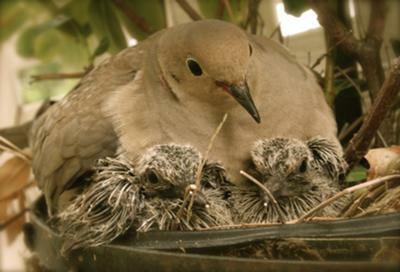 I'm relieved the dove hasn't abandoned the basket & both mom & egg are safe! Moving the nest can be interpreted as a predator attack. Moving it to floor level can make it easy for snakes,cats, and raccoons to attack the birds and eggs. Moving the basket, even temporarily, won't disrupt the process? Im slightly worried This morning I got scared near to death by a momma dove sitting on her egg. She's in my hanging basket...I don't remember her being there Day before yesterday when I last watered! Tonight we are under tornado watch, the storm looks to hit around 3a.m. I'm worried that the storm may be rough, too windy, etc for the mom nested in the alyssum of my hanging basket. Well my daughter and I were in the backyard swimming. My daughter noticed a bird in one of my hanging planters. She thought it must be fake. As I walked closer to pluck a weed from the side, this bird moved away from me. We were a little surprised. I got closer to take a look and noticed she had two eggs in a what appeared to be a half built nest. The dove just kept her eye on me as I took a closer look. I just spoke to her with a soft voice. I was very surprised that she let me get so close. I left her alone and for a few weeks she just stayed there sitting on her eggs. Then one day I noticed her eggs had hatched and there were two sweet babies. I took pictures of them and to be honest became very attached as though they were my birds. Checking on them several times a day. They grew very fast, I couldn't believe it. Then one afternoon I was horrified. I went to check on them and found one of the babies dead on the patio. She must have fallen or tried to fly and a cat got a hold of it. I felt so sad for the mother. She must have seen the whole thing. I was so upset that she had lost one of her babies. Then I got this bright idea that I would try to save the other baby so it would not have the same demise. I tried to remove the planter to place it in a safer place, but . . . the mother took off and the baby tried to follow. I eventually caught the baby and put her in the planter placing a net around it with an opening to let the mother have access to her. Well the baby kept getting out. I did not realize the babies could fly so soon. Well the baby disappeared over night and I was sad. Hoping that it would not be the next victim of a cat or other predator. I look all around the yard. In bushes, anywhere it might take shelter. Three day later I moved some fig branches around and there it was. It flew over the fence. Then a minute later appeared on the fence with mom & dad. I felt so relieved just knowing it had survived. I tried to get closer to take a picture of how much it had grown in just a week but they all flew off to the neighbors 2 story rooftop. The baby just got to the rain gutter and couldn't make it on to the roof and flew to the ground. It was so cute to watch them as a family. It's been about four days and I see them on the fence throughout the day. Yesterday I noticed the two adults in the planter. Last night I saw there was an egg in the nest. I was surprised that she was laying another so soon. That's when I decided to get online and read about them and I'm glad I did. Now I understand their cycle and habits. Hopefully she will continue to return to my planter and build her family. I enjoy watching them grow! We had a pair nest last year in one of our hanging plants. Their efforts killed a $50 hanging plant. This year, we took BBQ skewers and lined the inside of the pot so that there is absolutely no place for them to sit. Go find another planter. This is our first experience with nest in our planter. We hung the fuscia just a week ago and now there is a nest. When we looked last night there was just one egg but the mother hasn't moved to see if there are more. So what about the plant? Do I just carefully water it or let it go. I do not want the plant to die anymore than I want the bird to suffer. Any suggestions or ideas? Folowing up with Birdell and Birdean here's a shot of the twins! They flew away Friday and Mom is looking for them... I think... They were ready to spread their wings! They sat and flapped for 2 days on the edge of the balcony and then finally took the leap and off they went! Not sure if she is upset and cooing trying to find them or nesting again but she keeps checking back in and making some noise out there. 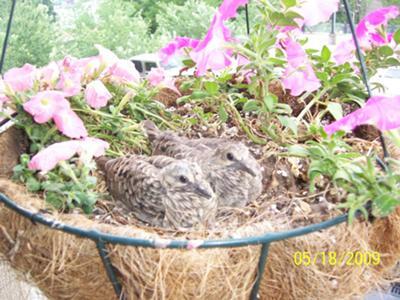 This is my first experience having Mourning Doves nest in my hanging basket in which I have planted impatients. I was startled when I was watering to notice a flimsy type of nest, and I initially thought this was not a good location for birds to "settle" so I removed the few twigs. Several hours later the birds returned and soon after the first egg appeared! A second egg followed a day or two later. Mom and dad have been taking turns sitting on eggs for almost 2 weeks and when they are away, I water the basket with a small water can and take care not to water over the eggs. The other day I checked to see if birds had hatched and both eggs were still in the basket. Last night the bird frantically flew out of the planter and when I went to water, I noticed only 1 egg was there. I felt so sad. The hanging basket is mostly covered by our porch and the impatients have continued to flourish, even with the bird sitting on the eggs. Actually, all you see is a tail sticking out now!!! I am wondering what might have happened to the other egg. It doesn't seem likely a predator would have gotten to it after all this time but I guess anything is possible. I was wondering if the doves ever destroy their own eggs if they know there is a "problem" with it? Just curious as there are no traces (signs of shell breakage etc) of the other egg. 5 years ago a dove took up residence in our planter right outside of our kitchen window. We'd greet her in the morning and we're captivated as we'd watch exactly what this site says - the male would relieve her for part of the day and bring her twigs early on. We were so excited when the following year the entire scene started all over. My 3 children became experts on the progression of their little lives with us. This year we had 2 round of eggs - so fun. Then 3 years ago, when my youngest was up to 2 years old, the birds became "his birds". Again 2 wonderful rounds of eggs and we actually caught one learning how to fly and get around. When the baby fell from the planter I thought for sure I'd have some explaining and "clean up", but she got herself together - shook it off and in a few hours could flutter around. We repeated again last year as well and knew to clean out the stems from the annuals from the previous year to prepare for possibly another spring. This year, about 3 or 4 weeks ago when I was making breakfast I heard the familiar sound and went running to the door. There they were - building again and back for yet another glorious year. My youngest tells everyone, "OUR bird is BACK!" We'd like to know if these are the babies that return to where they are born or possibly the same mother? I swore I saw 2 fat ones the first week w/the male. Do the women take turns? Thanks to anyone that can give us the info! I have discovered nests in the ferns hanging on the front porch of my home. Although they were empty when I first saw them I let the nests remain. 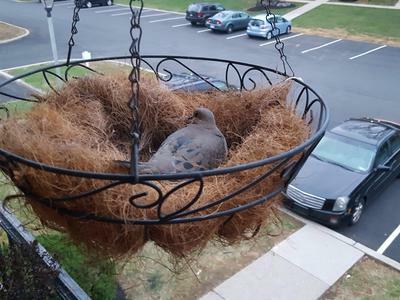 This last week walking out of my front door I saw that a dove was sitting in one the nests, apparently incubating eggs. We have tried not to get too close and awaiting the hatchlings to appear. The mama and papa doves were scoping out our balcony for a nest in early February. After 3 weeks we noticed mama visiting us quite often. 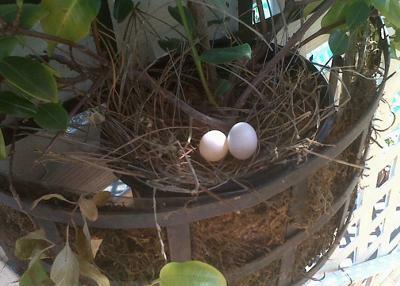 After a few weeks I peered into our hanging basket that was void of any flowers, and noticed two small eggs. From then on Mom and Dad has been sitting in the nest almost 24 hours a day! After reading the above articles I am confident that Papa must be sitting there as well however they both look the same! My Two children and I are careful to not disturb them although it is difficult because she is just so adorable! Help!! I think the baby birds are dead! Update 2 two baby bird eggs. So the other night I was opening my door and I frightened mama. and she flew away. I peered into the nest and I found the baby does looking quite larger than I had anticipated. They weren't moving and they weren't making any sounds. Are they dead? Are baby doves supposed to be making noises when they first hatch? Please help!